The Yankees are in town today. Listening to Vin Scully call the game and talk about people like Joe DiMaggio, Yogi Berra and Mickey Mantle is pretty awesome. I said yeah, and the guy’s son comes over, a young kid about 12 or 13 years old. The kid says something like “Man, my dad hates the Dodgers”. The dad and I got a kick out of it, I laughed it off, and asked them sarcastically, “So what do you think of our new coach?” referring to Joe Torre coming over. The dad let out a classic New York “Ohhhhhhhh! !” and the son sort of had a sad look on his face, and sat there silently stunned at having been reminded of Torre’s leaving, and the fact that I, the enemy, was here eating egg and bacon, wearing the cap of the enemy. That’s the kind of story I seem to run into at every turn in New York. that’s also what this game makes me think about. 2008 was the last year for old Yankee Stadium, and Shea. I got to visit them before they closed, and it was really magical. I love the history if both those baseball cathedrals, and to see them in their last year, the feeling was not lost on me. I’ve been driving my car to work just about every day for the past two weeks. The absolute worst traffic LA has to offer, and she’s made it through without a hitch. I’m absolutely super proud of her. I just wanted to say, I’ve finally named her. I went the geek route, and was researching names for a couple of weeks, and I finally was sort of hovering around “Ethel”. Then the other day, to avoid Hollywood Freeway traffic, I took the 210 home, to the 2. Nobody on the freeway, and just flying over the hill. It felt stupendous, and my thoughts went back to her name. Ethel. I said it in my mind a couple of times, could I live with that name forever? Traditionally, you’re not supposed to rename a vessel. Would I change my mind? Then, on the way up to the 2, making a nice wide right and stomping on the gas, I thought about Ethel Mertz, from “I Love Lucy”. Lucy’s notorious neighbors. . . . and a couple forever. Not only that, but William Frawley, who played Fred, I’ve always loved. Vivian Vance, stayed by Lucy’s side until 1968, when my car was born. That was enough. The name is there, her name is Ethel, and it always will be, if I can help it. Took the Bohemian Pilsner out for a sample. Last night I sampled my first ever Bohemian pilsner. I haven’t figured out what to name it yet, but it smelled to me like a Pilsner Urquell, and it tasted awesome, if a little light for my taste. I’ve already been asked for a sample, and I’ve had to turn them down. This batch is specifically for a camping trip I have planned with some friends in late August. We’re going up to Kern again, and last year I took an IPA, and my buddy took an Apfelwine. This year, two more of us in the group have started brewing, so they’ll be bringing a wheat beer, and a dark beer, that they will likely be barrel aging. 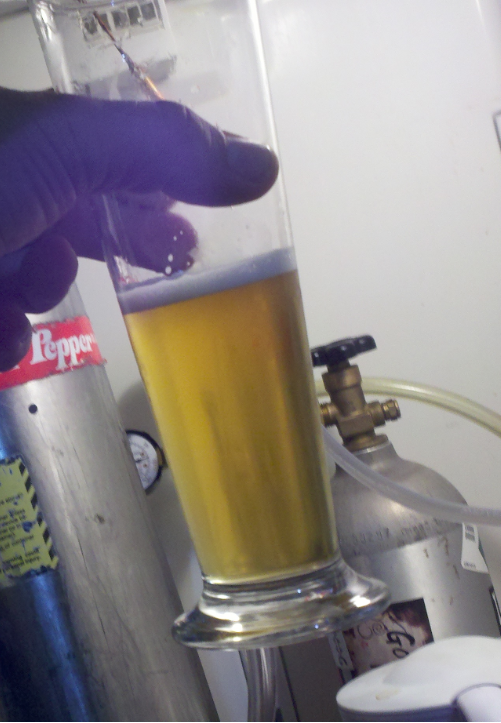 Anyway, here is a shot of my Pilsner, on first sample, after only 1 day on CO2. 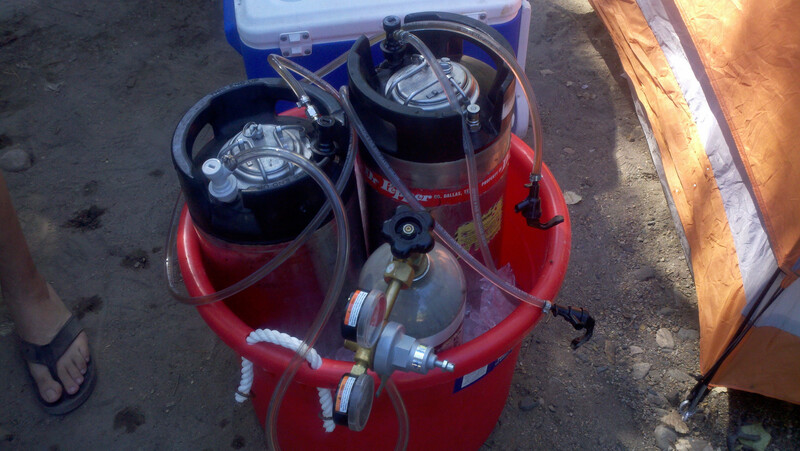 It should be ready by Friday, but then I’ll take it off the gas, and let it lager until the camping trip. I’ve also picked up a nice cot, and some paracord, and am messing around with learning how to wrap different things in paracord like the military used to. Its pretty handy stuff, and great for a survival or outdoors pack. I’m hoping to finally land me a trout north of a certain bridge up in Kern, I’ve caught one down by the campsite, actually fishing from my tent, but never one of the elusive ones up in the higher part of the river. That’s where I’ll be focusing my energies this year. Sunset at Irwindale Drag Strip. My buddy saw this and said “Good old Dragstrip! Looks like it’as 1969! I agree, except with more smartphones. Took a little trip to the dragstrip in my cousin’s rotary. There were some awesome cars there, took a few pics of my favorites. Unfortunately no Mopar.